It is a period of great upheaval. 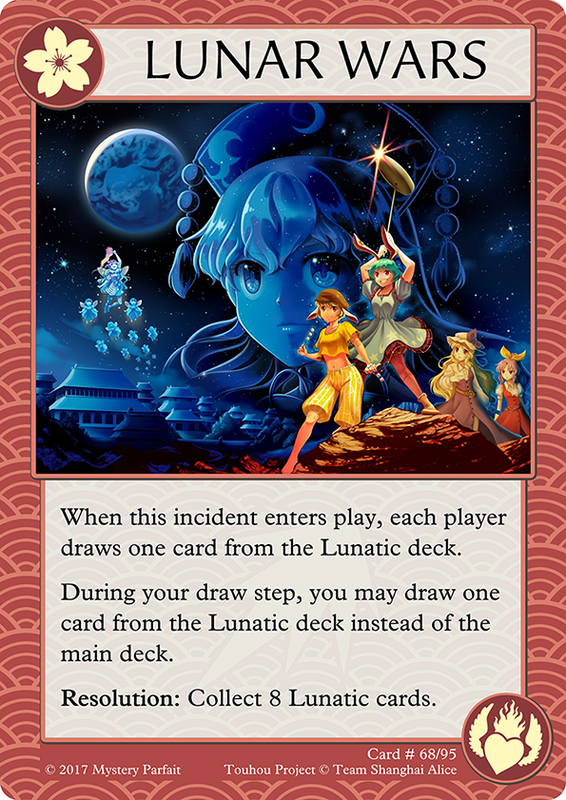 The vengeful Junko has begun her assault on the Lunar Capital, while the impure of Gensokyo run amok. 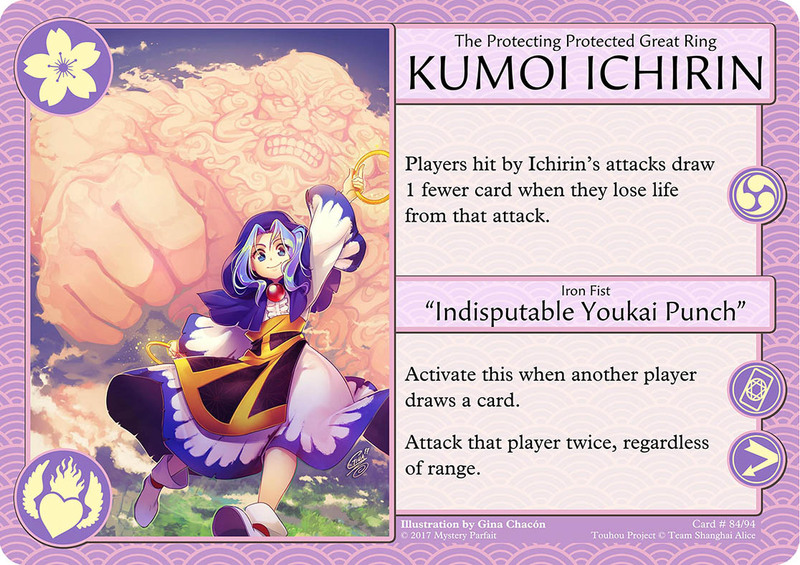 The things that can’t be cut by this youkai-tempered Roukanken are next to none! 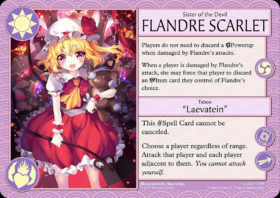 For you lovers of spectacle out there, I bring you Erase Shot, a new Battle Deck card from Lunatic Extra. 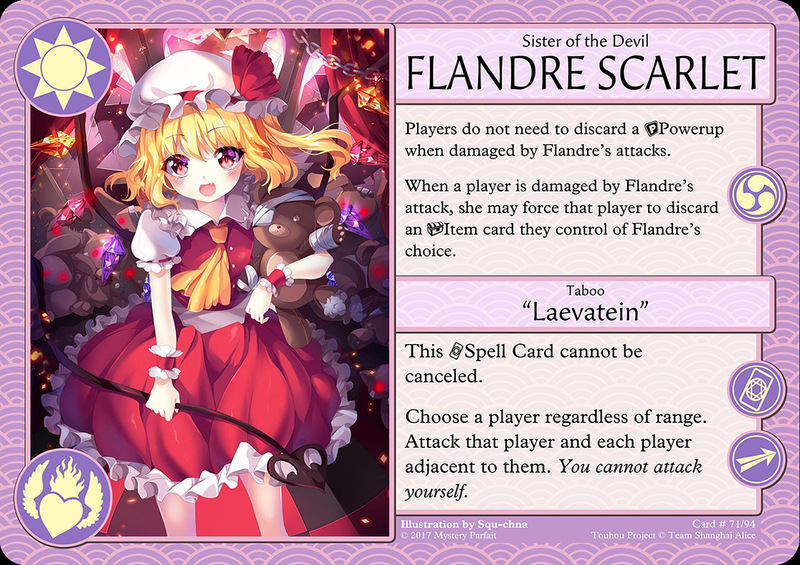 This card combines the basic effects of Shoot and Graze, while not giving you the bonus options those cards present. The awesome art was done by Japanese artist Mieharu. Before you ask, when playmats return (Soon TM) this will definitely be one of the options! If ears+tail is 10% furry, does that make Ran 50% furry? Another piece by Gina today because why not? 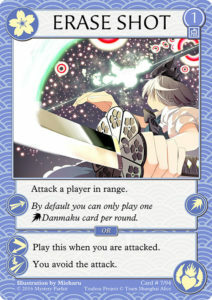 Yakumo Ran joins Danmaku!! 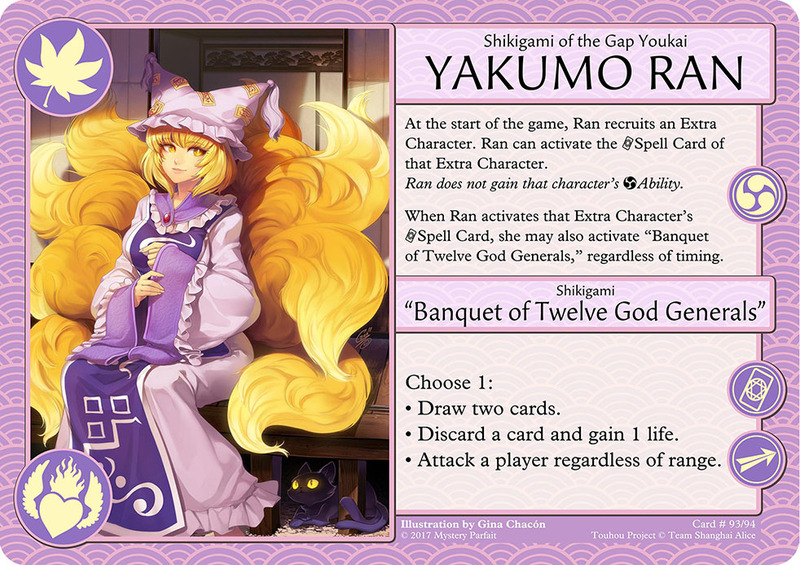 as the second member of the Yakumo family. 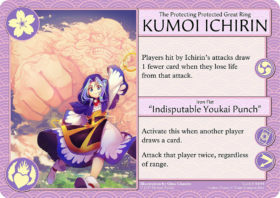 With her power to control Shikigami, she sacrifices any meaningful Ability to instead have a super-sized and super-flexible Spell Card. 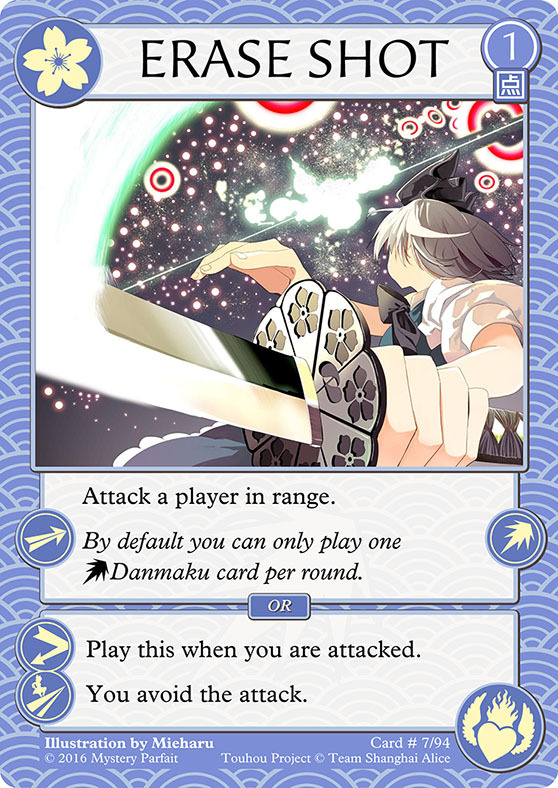 Ran cannot change her Shikigami (Extra Character), so choose wisely at the beginning of the game! Of special note are how Bomb cancels work when facing down Ran. 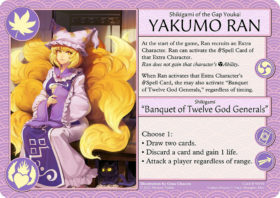 If Ran’s Extra Character’s Spell Card is canceled, she cannot activate “Banquet of Twelve God Generals.” However “Banquet of Twelve God Generals” can be canceled separately from her Extra Character’s Spell Card, if you choose to do so, or are forced to do so because she has a Scarlet sister as an Extra Character. Unzan is here to teach you kids a lesson! 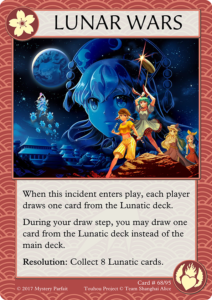 Unzan is a traditional man, he doesn’t like uppity kids drawing the entire deck into their hand and taking forever on their turn. Unzan believes a real youkai doesn’t need fancy things like damage draw or various ceramics of avarice. All Unzan needs is his fists. Unzan is not all grit and muscle however, he can appreciate delicate things, he keeps a cute hitbox around to show his delicate side. Unzan was illustrated by Gina Chacón, who came to our aid in a sea of artists who don’t draw men who are, ahem, distinguished. PS Important Reminder: We are accepting Lunatic Extra feedback right now!